One of the biggest complaints I hear from dog owners is that their “dog pulls on leash.” Sometimes this can be so extreme that their dog is actually pulling them down, or even pulling so hard that the owner drops the dog’s leash, and now the dog is running around the neighborhood. Egads. That can be scary, not to mention very dangerous. Before I get started on teaching you some effective skills on teaching your dog not to pull on his leash, I recommend reading my post WHY I DON’T LIKE DOG COLLARS first. So what kind of options do I prefer? Harnesses and headcollars are my personal preference. I lean toward harnesses more than head-collars, and more specifically, I like front-clipping dog harness where the leash attaches to a D-ring on the dog’s chest. These types of harnesses aid in teaching your dog how to walk politely on a leash, because when your dog starts to pull on his leash, his chest turns around toward you, allowing you to refocus your dog.That said, they need to be used and fitted as directed to keep your dog safe. A headcollar that is tight is not safe if you allow your dog to keep pulling and it keeps his head at an unusual angle. A front-clipping harness that is tight and again pulled to the side is not the correct way to use the tool. Every dog should learn how to walk politely on a leash. But before you set out to tackle this challenging behavior, be prepared to practice every time your dog is leashed and remember to have a lot of patience. This is not a behavior that happens quickly, and it is important to practice walking skills daily if you want to master this behavior. Here are some techniques to use when teaching leash manners. Follow Me Off Leash (inside the house, or in a fenced in area): You must create the association that you are the best thing in the world, engaging and exciting. If your dog realizes how much fun you are, he is much more likely to be attentive to you. While your dog is close to you and not too distracted, make a high-pitched smooching sound and back away a few steps while you are still smooching. As your dog follows, praise and encourage him. Allow him to “catch” you and give him a pet, treat, or play with a toy. Repeat this exercise changing direction, skipping and have a good time allowing your dog to catch you. Remember, this is supposed to be fun for both you and your dog, so get silly and creative and change directions. Walking Next To Your Side Off Leash (inside the house, or in a fenced in area): Grab a handful of treats or food kibbles and lure your dog with a treat to your left or right side. Give him a treat when he gets into position. With your handful of food, place your hand in front of his nose, say, “OK” and take 3 steps forward with your dog following the treat. After step 3 give him a treat. Repeat this process and vary the number of steps before giving him the food treat. Whenever your dog is attached to his leash, you need to be prepared to work on his leash manners. There is no “off time” when he is attached to his leash. Teaching good leash skills can be very challenging. When you set out to practice leash walking, start with a training time in mind, such as 15 minutes. Do not start with a walking destination like “around the block” or you are likely to get very frustrated. If it takes you and your dog 15 minutes to walk down to the end of the driveway, then so be it. You are setting the foundation to a life-long skill of not pulling on the leash. 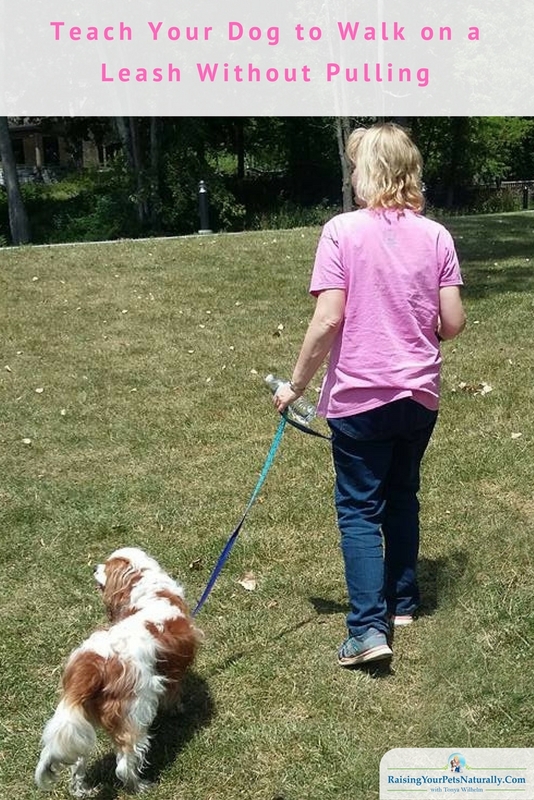 These early stages are vital if you want to have a great walking partner in the future. 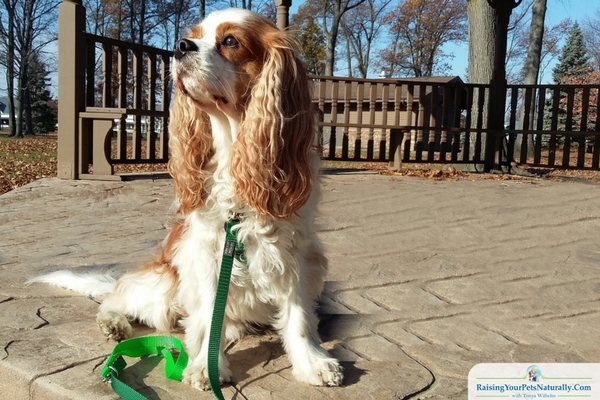 Your walk clock starts the time you pull out your dog’s leash. If he is jumping around acting like a silly puppy, just stand there and wait for him to settle down. Once he has settled down, bend down and attach his leash. If he spins out of control and runs off, stand back up and wait for him to come back and wait again for him to settle down. Repeat until you can calmly attach his leash. This may take 5 minutes or more at first, but over time he will learn that running and jumping around will not get you to attach his leash. Pick either the follow me game or walking next to your side lesson. You can either practice inside the house, outside in your yard, or working toward the neighborhood. Remember your time (15 minutes etc. ), not a destination. The other option is the treat bag method. This is when you decide how many treats or dog food kibbles you want to give your dog during his walking exercise. When you are half through his stash, turn around and come back. Because walking outside will be very distracting, you will likely need a high motivator such as cooked meat, or 100% meat dog treats. Once his leash is attached, stand very still holding the leash on your hip. Only if the leash is slack will you move. Don’t ask him for anything; let him figure it out himself. Be patient; eventually, he will slacken the leash. Once he does, tell him how smart he is and start to walk. If the leash gets tight, immediately stop and plant yourself as before. You will probably only get one step at first. Repeat as before, waiting for a loose leash again. Opposite Direction or Penalty Yards On Leash: Another technique is to go the opposite direction when your dog pulls on the leash. When your dog pulls on the leash, make a smooching sound and turn the opposite way or just take steps backward until your dog catches up with you and has a loose leash. Once he has caught up with you, start walking again. You will be teaching your dog every time he pulls forward, you are not going to allow him to go in that direction. Become A Statute On Leash: I only recommend this technique if your dog is in a harness. When your dog’s leash is tight, just stop. After you stop, make a smooching sound and as soon as your dog returns to you, praise and continue to walk. Combinations You can choose a combination of the above methods, even during one walking exercise. The important thing to remember is that you are teaching your dog that when his leash is tight, he will not be moving forward. I will say it again: have patience. Teaching your dog to walk politely on a leash around so many fun smells and distractions is very challenging and takes lots of practice and experiences, but is absolutely worth it in the end. It may take a good year of actively working with your dog, but then you have 10+ years of a great walking partner! Have fun, and get moving. Do you enjoy walking your dog? Tell me in the comments. 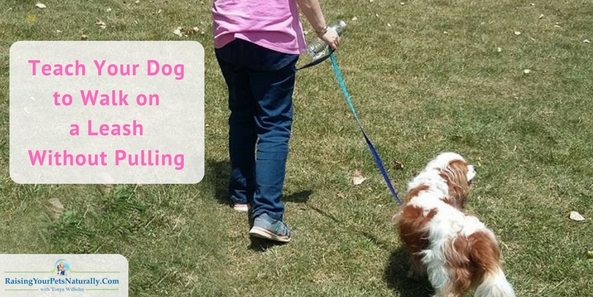 Pingback: Puppy Training and How To Train a Puppy From Potty Training to Leash Training. What is the First thing to Train Your New Puppy?